The Potomac Conservancy donated over 100 seedling trees to be planted in the City's Parks and Recreation Maintenance property on Chicago Avenue. 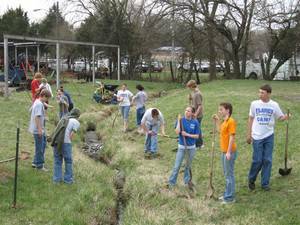 Students from Mr. John Hoover's Biology class at Eastern Mennonite High School planted the trees along stormwater ditches on the property. These trees will help prevent erosion, filter stormwater runoff, and reduce maintenance on the property.